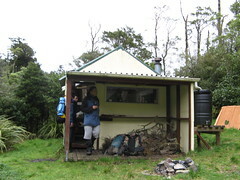 Huts visited: Stanfield Hut (0 nights), Cattle Creek Hut (1 night). People: Darren, Alex, Clinton, Matt, Michael, Patrick and Meeeee. I think I probably ate something bad for lunch on the Friday that we left. All of that afternoon I had a headache, and this became a bit more of an issue when I got sick at 10.30pm Friday night after setting up my tent fly in the campground 200 metres from the Tamaki West road-end. Fortunately for me, though, I began to feel quite a lot better after that. 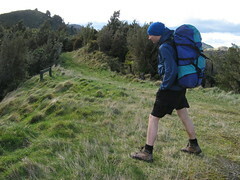 We began on Saturday morning at about 8.45am by climbing the spur from the campground onto the ridge above the west branch of the Tamiki River. We had spread out quite a bit after an hour or so of walking, and near the front I started getting a bit concerned about the sudden down-hill that the track was taking, which wasn’t something I could see on the map. After mentioning some concerns with Michael, Clinton and Alex, we ended up back-tracking for a few minutes to find Darren, who promptly pointed out that I’d been looking at a part of the map about 3 cm away from where I should have been. The ridge above this river has a really easy track, but it seems quite exposed in windy weather, and we spent some time leaning into the wind. Before long though, the track took us downwards again. After a short jaunt up the river, we reached Stanfield Hut, where a couple had set themselves up for a hopeful weekend of hunting. By now it was about 11.30am, and we stopped for an early lunch. The rain started to come in as we waited, so everyone took the opportunity to put on some more wet weather gear. From Stanfield Hut, we carried on a little further up the river towards a very thin spur, which looked awkwardly undercut when I took a peek right near the bottom of it. (Not really dangerous, however — it had a lot growing on it.) Climbing this spur was quite a lot harder, and we spread out quite a lot over the 270-odd vertical metre climb. The track split at the top, and Darren suggested that Michael, Clinton, Alex and I should probably go on along the ridge ahead, towards Cattle Creek Hut, while he went back to find Matt and Patrick. Trekking along the ridge to the east of Cattle Creek was a lot of fun. 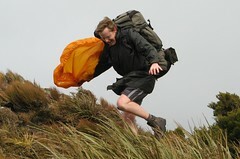 The whole ridge is very exposed, and simply standing in several places was very difficult. We could see Cattle Creek Hut from some distance away up on the ridge, though, and this was encouraging. Being towards the front, I took the opportunity to roll around in the dirt and take photos of people trying to approach behind me. In exchange for a few photos, I sacrificed some bubble wrap packaging, which blew out from my camera bag, and I think I was very lucky not to have lost anything more valuable. Personally I think it was worth it, though. We finally made it off the top of the ridge, which was a bit of a relief, and from there it was a descent of about 160 metres or so, down to Cattle Creek. The track came down almost on top of the hut, although it took a few minutes to find a way through the vegetation on the far side of the river. We’d previously made arrangements with Duncan to wait for the others until about 3pm, and then go back to find them. Given it had taken us somwhat longer than expected to reach the hut, however (it was already 2.30), we revised our plans and decided to wait another hour or so until getting concerned. Sure enough, Darren walked in with Matt and Patrick before too much longer. If there was some wet paint on the walls at Cattle Creek Hut, it could have kept us amused. Sadly nobody had bought any cards or anything, and the main piece of reading material was an old Women’s Day magazine. Happily I survived though, and I didn’t even have to read about Hollywood’s weirdest couple. Dinner that night was great, thanks to Darren, Clinton and Alex whom I think were most responsible, and with nothing else to do, we sank into the bunks at the great bedtime of 7.30pm. Somewhere between the rampant snoring, it rained for most of the night. In the back of my mind I was a little concerned that we might end up trapped at the hut by some flooded rivers. This didn’t happen, though. After some discussions on Sunday morning, we decided to walk back up the rivers, instead of over the ridge. This was for a couple of main reasons… one of which was that we thought it could be more interesting than to simply return through where we’d already been, plus Patrick in particular was hurting a bit from the previous day, and wasn’t 100% confident of doing a lot of climbing. The main complication with this was that we didn’t know quite what to expect from the river, so we had to be ready to back-track if it got too complicated. The weather had cleared a bit though, and the rivers didn’t appear to have been seriously affected by the rain. It worked out really well, as it turned out. 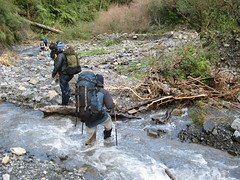 The walk south along the river from Cattle Creek Hut was fairly straight-forward, apart from a few circumnavigations of little waterfalls and fallen trees. Within an hour and a half, we’d found an old track (marked on the map), which after some minor bush-bashing, would lead from the river up to a main track junction at the top of a spur, where we’d walked through (and turned the other way) the previous day. I took the opportunity to play with my compass and give myself a bit more experience. After a little skidding down the mud on the spur, we reached the West Tamiki River again, on the other side, and flowing in the opposite direction. Alex had rushed ahead to Stanfield Hut by the time I arrived, but Michael and I waited at the river for everyone else to arrive. We then carried on to the hut and met Alex again for our Sunday lunch. From here, we decided once again to avoid going up over the ridge (where we’d been on Saturday), and instead to follow the river back down to the campground at the road-end. Although there was some light rain between the muted sunshine, it was quite a relaxing walk. I’m pretty sure that nobody even fell over, or was swept anywhere by the river.